Jim from Colorado Springs, Colorado would recommend this to a friend. 81 yr old of below average mechanical ability. Not too difficult for a numbskull like me with one exception. Did not fully understand the adjustment of the limit switches at the top of the glide. In my ignorance I stripped out the threads on the swith away from the wall in the switch on the track. How can I get a replacement threaded insert ? Need badly to get it back in action as the wife and I both need it. BLC from Middletown, OH would recommend this to a friend. Instructions on distance from wall were not accurate. If we had followed the instructions to the letter the seat would hit the wall. The manual called for 3.5" and we spaced our unit at 4" and the seat just misses hitting the wall. I would prefer that lockout feature would allow you to remove the keys out in both the lockout and unlock position. Would have been nice if the mounting hardware for concrete install had been available/included. Overall I think the unit will be very satisfsctory for our application. Jennifer B from San Francisco, CA would recommend this to a friend. "My Representative, was great! It was his extensive knowledge and consistent follow-up that made this process super-easy. Other places tried to sell the most expensive product they had, but he took his time and never rushed me into anything. In fact he did the opposite and had me double and triple check things to make sure I was ordering exactly what was needed and tried to help save me money. He gave me tips on the install and I always knew what to expect every step of the way. I would work with him and his company (4 medical supplies) again in a heart beat!" It was exactly as described. 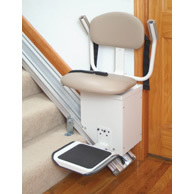 The stair lift is a smooth ride and easy to use. Harold from Wheeling, WV would recommend this to a friend. 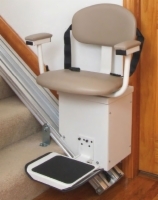 I installed the stair lift for my mother-in-law because she was having a lot of difficulty with the stairs because of bad knees. It seemed to be a very well built unit and I was impressed with the ease of installation. This is a real lifesaver! A satisfied caregiver from Central Illinois would recommend this to a friend. My mother-in-law came to live with us in October of last year and all of our bedrooms are upstairs. She has many mobility problems including bad knees and hips. If it were not for the stair lift she would be a prisoner upstairs! This gives her the ability to come downstairs -- something she would not be able to do on her own. I had a problem with my sciatic nerve 1 month ago and could not walk. The lift was my lifeline as well. The company is very good to deal with and we are happy with the lift. 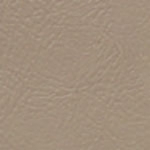 Teresa from Las Vegas, Nevada would recommend this to a friend. Delivery was right on time. The stair chair was a little larger then I originally thought, but overall it was a good buy and works well. 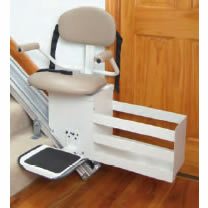 The Stair Lift is very well made and sturdy. Turk from Chatham, NJ would recommend this to a friend. 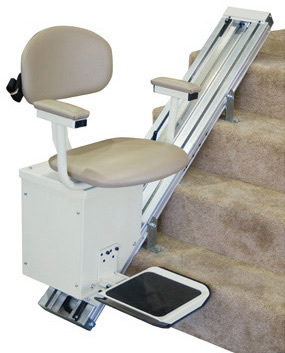 The stairlift is very sturdy when riding up and down the stairs. It's a bit heavy if you're trying to move it on your own. Easy to install. Plug it in and go! Patty from Lancaster, CA would recommend this to a friend. This stair lift is very easy to use and very safe for an 89 year old mother.